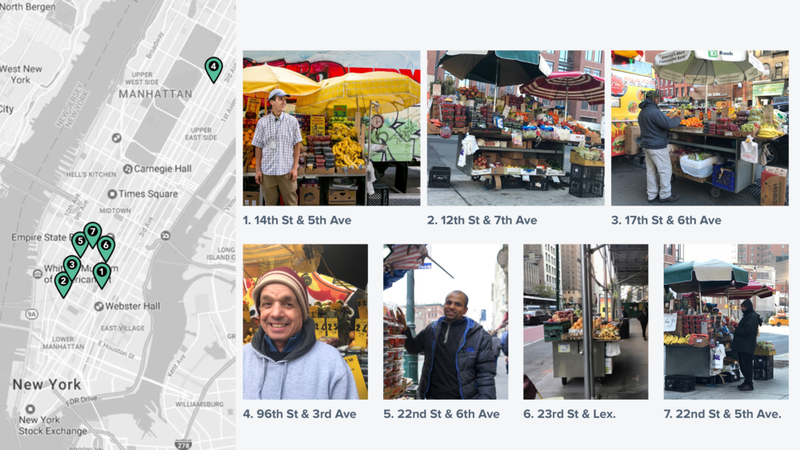 To improve the underrated and under-supported small service business in New York City - the produce street vendors. Provide the vendors the tools, effective design solutions, and competitive edge to innovate in their market space and to thrive with their own superpowers. There are more than 20,000 street vendors in New York. Most of them are immigrants, 95% of the vendors speak 11 languages other than English. This is a highly diverse community that brings so much life and energy into the city. Within that population, there are about 10,000 to 12,000 produce vendors. They work very long hours and in harsh conditions. 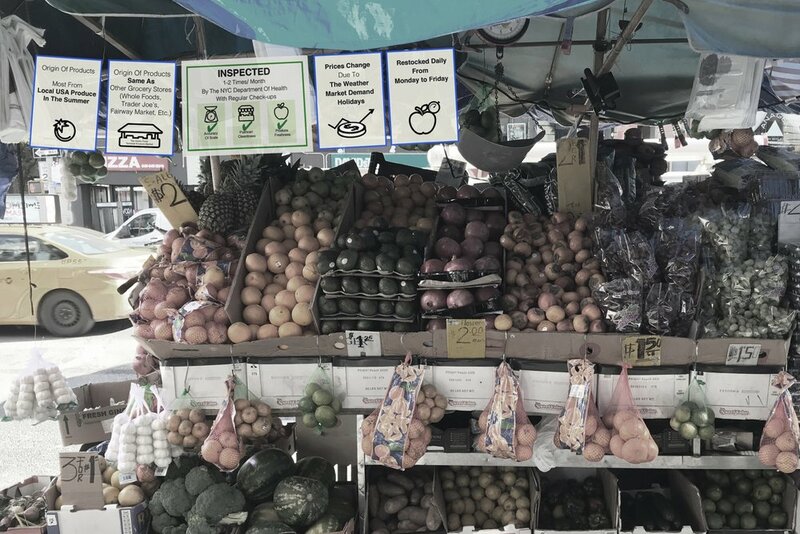 According to Rules and Regulations for Mobile Food Vending NYC, produce street vendors are classified as class E, a green cart or other non-processing mobile food vending unit in or on which only non-potentially hazardous uncut fruits and vegetables are sold or held for sale or service. A permit - to sell with a pushcart. The waiting time to get a permit is more than a decade. A license - to sell food on the street. Both can be renewed every 2 years. There are roughly 12,000 vendors right now in New York, but the permit cap is only 5,100 since the 1980’s. This leads to the fact that many are vending illegally. There are also black market transactions between non-permit holders who want to vend and the permit holders who take advantage of the situation. Some vendors lease their permits for between $6,000 to $8,000 every 2 years. Others hire the non-permit holders at a low hourly wage. Vendors are subject to hundreds of rules and regulations. All street vendors accumulate about 25,000 tickets per year. In 2016, out of more than 4,300 food carts and trucks inspected in Manhattan, there were more than 5,000 violations. The most ticketed violation is when vendors are parked more than eighteen inches from the curb (22%). Another one is when their license isn’t visible (5%). These easy-to-make mistakes can be penalized to $1,000. This can put vendors out of business right away. Vendors perceive that the New York government does not help them much. Inspectors see them as an easy target for exploitation. There is also considerable unfairness related to health code enforcement. They constantly feel frustrated, depressed, vulnerable, and discouraged. While many customers recognize that the items for sale are cheaper and shopping time is shorter than supermarkets, they don’t perceive the food as fresh and of a high quality standard. Some try to strike bargains on the items for sale instead of respecting the grocery stand’s prices as legitimate and fixed. Street vendors are overall making an average annual profit of $14,000 per year. This is the least profitable type of street vending since the fruits and veggies get easily spoiled due to environmental conditions. Their recurring expenses include the garage rent, transportation and taxes. On top of that, permit and license renewal every two years comes at quite a significant cost. The hundreds of regulations and fines are huge problems for the city. A lot of vendors are not able to pay for regulations. In 2008 and 2009, the city spent almost 16 million on regulation enforcement. And 15 million was uncollected in 2009. One can clearly see how much the city has lost in just enforcing the regulations. 1. As far as having a regular customer base, we discovered that it is hard for vendors to acquire new customers. 2. Unclear information regarding their prices and the health regulations slows profit. 3. Interactions are difficult between vendors and their customers as there is often a language barrier. 4. Vendors rely on their own tools and equipment, such as their air-conditioned truck which parked directly behind the stand at all times for the vendor to constantly restock and ensure that the items for sale are fresh and well preserved. Every night, the same truck gets the produce from the Bronx Terminal Market. 5. The entire business transaction in founded on a monopoly system. They get their produce from the Bronx Terminal Market, where this source controls the diversity of the produce and the price. A rising cost of supply puts the vendors in trouble. 6. 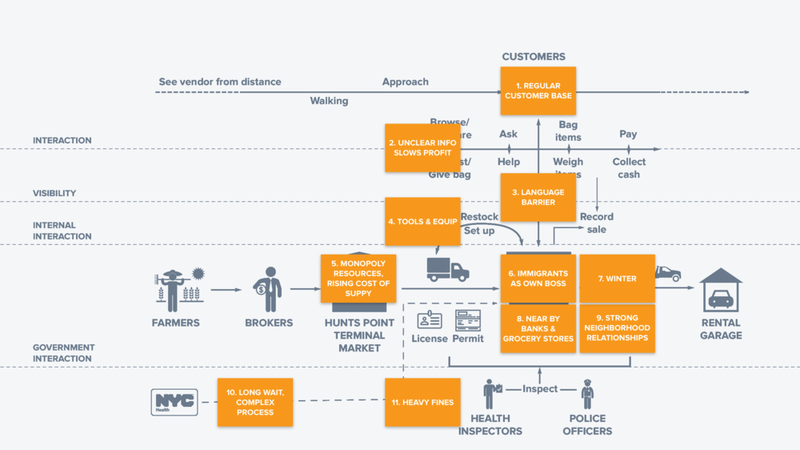 Vendors are mostly immigrants who chose this business to be their own boss, and are therefore a part of an entrepreneurial autonomy. 7. In the wintertime, vendors struggle in extreme conditions. Their fruit freezes and they are not able to sell anything. 8. Many of them are strategically located nearby banks and grocery stores, where the vendors intend to be in highly trafficked areas and thus catch the cash-carrying customers. 9. Throughout the neighborhoods, they form supportive, not competitive, relationships with businesses around them. 10. Vendors have to undergo the long wait and complex process to apply for the license and permit. 11. Their biggest challenge is the heavy fines. The vendors' salient attributes are convenient, cheap, quick, and sold via the exchange of personal relationships. However, the service has faced many challenges. We placed all the pain points discovered from the research onto the Risk Matrix and decided to tackle the ones at the top right corner as those imposed the highest risks to the business. They were categorized into three main problems. 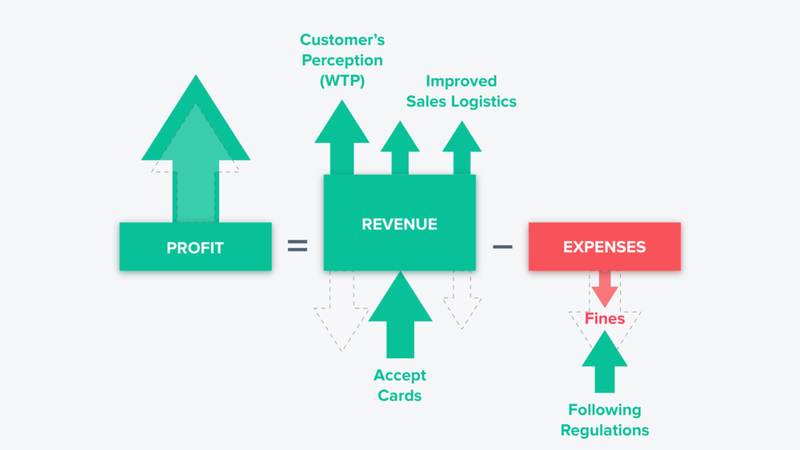 We crafted three design solutions in response to these problems, with the expectation that those would eventually help to significantly increase the vendors' profit. Palash is an immigrant from Bangladesh and has been working as a vendor for 9 years. He operates his food produce stand located on the corner of 22nd Street and 6th Avenue in Manhattan from 7:00am to 7:00pm every day. His boss (Cenjiz) also frequently visits the grocery stand to oversee the productivity of the service. Cenjiz and Palash were kind enough to share their insights about the business and let us test the prototypes of our solutions on their stand. Our prototypes were iterated based on feedback from vendors, customers and walking-by pedestrians. WHAT ARE THE HIDDEN VALUES? There is a plethora of valuable information that is not communicated clearly for the customers. Origin of produce - The produce originates from Hunts Point Terminal Produce Co-operative Market in the Bronx, which is the same source for all major grocery stores, that is, Whole Foods, Trader Joe’s, and Fairway Market. Another point is that all produce is locally sourced in the USA in the summer. 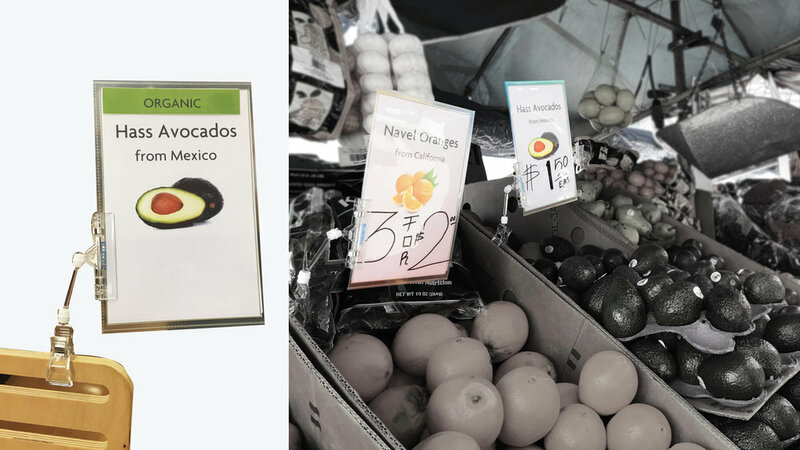 Quality and cost-effective prices of the produce - If we compare the price between Trader Joe’s and the street vendors, it is apparent that the street vendors sell their produce at a much cheaper price point and for the exact same, if not better quality. There is also value in educating customers about daily price changes due to the weather, market demand, and holidays. Freshness of produce - It is restocked daily from Monday to Friday. In contrast, the big grocery stores keep their produce in the warehouses before shipping them to the stores, which sometimes takes months. WHAT SLOWS DOWN THE SALES? Only one seller per time - An occasional lack of attentive service since there is only one vendor at the grocery stand who has to strike an ongoing balance between restocking fresh produce from the air conditioned truck and attending customers during their shopping experience. 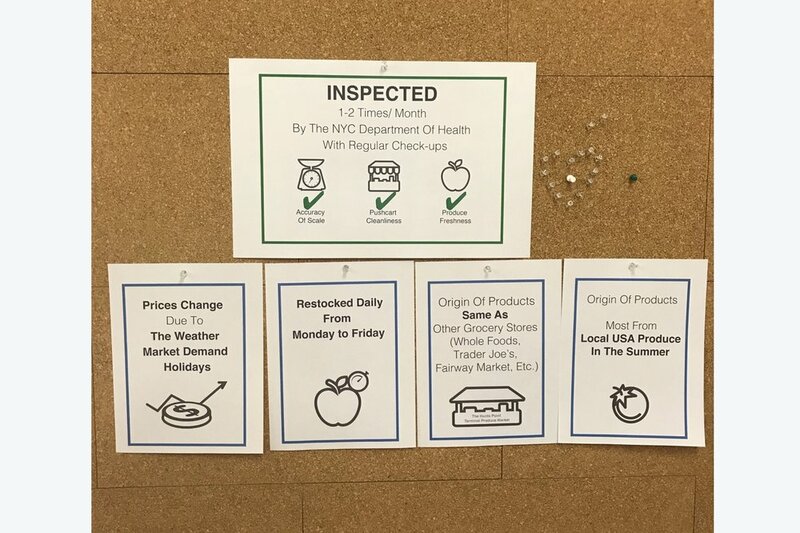 Price indicators - There is a level of frustration that does occur among customers as prices are not clearly displayed throughout the grocery stand. Furthermore, vendor does not have an efficient system of storing, reusing, updating and displaying their price tags. Stand presentation - Many essential items for sale are physically out of reach. The apples, for example, are positioned in the back of the stand and the entire inventory design is not logically arranged for customers to instantly comprehend where their items of need are located. There isn’t a sign on the grocery stand that communicates that the produce is indeed organic. Location of price tag is confusing as it doesn’t clearly indicate which product the price is for. Also, it’s all handwritten and in different colors, some old information is not yet removed. 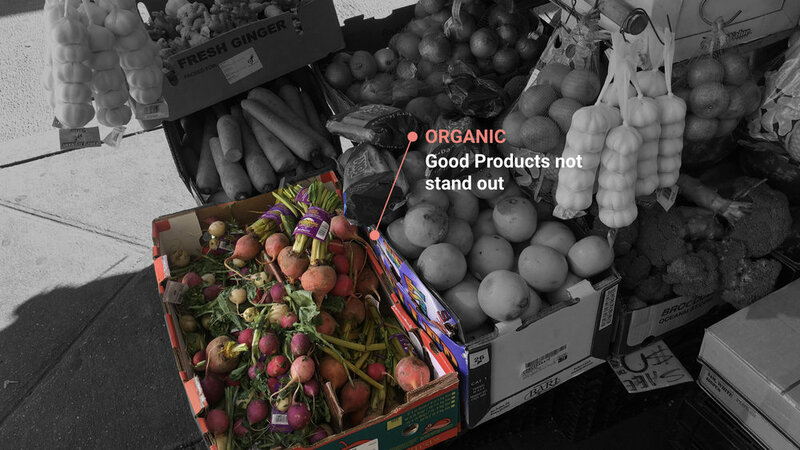 Organic produce is set on the side of the stand, thus lack of visibility. It also doesn't have an organic sign. How the seller currently manages the price tags, a bunch of tags in different shapes and colors. For a street stand that is only operated by only one person per time, it’s a lot of work to update the price. WHAT ARE THE CURRENT PROBLEMS VENDORS HAVE WITH THE CITY REGULATIONS? Language barriers - Communication is very important to collaborate with polices and health inspectors. However, vendors do not know how to stand their ground and defend themselves because of language barriers as most of them are immigrants and English is their second language. Too busy to remember - Even though the sellers know all the regulations, they are too busy to take care of the business. Regulations are oftentimes simply forgotten. 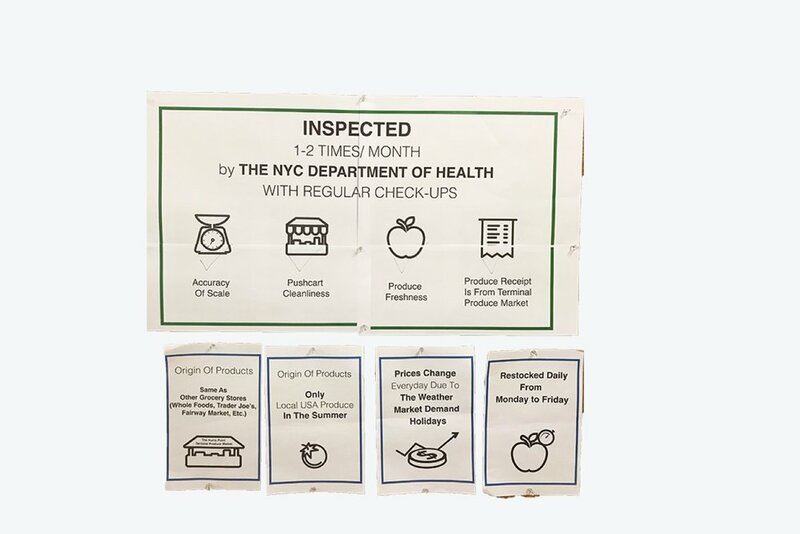 Existing good materials - Vendor Power, a poster uses simple graphics and minimal text — in the five languages most commonly spoken among NYC’s vendors — to explain some of the most-often violated laws. But how to turn those valuable information into actions? A “Vendor Power” pamphlet available in their own language, reminder measuring tape, a ruler, and stickers for the fines. 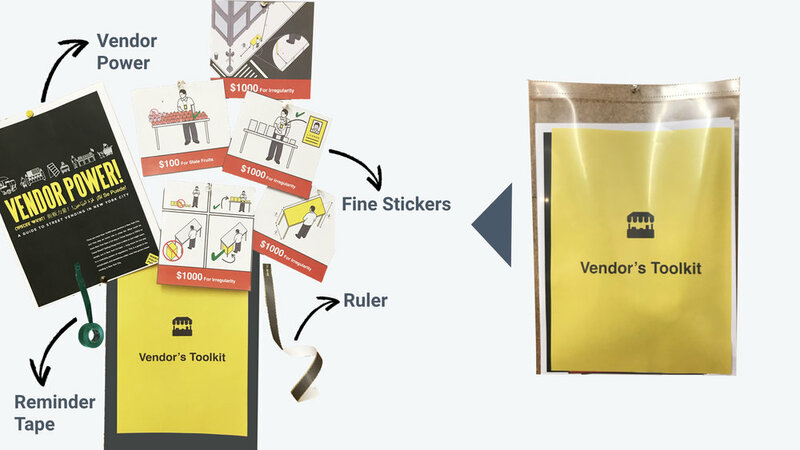 The stickers inform and motivate the vendors to follow regulations by using the graphics from the Vendor Power, coupled with the amount that they’d be charged as informative warnings. Vendors can stick the tape to the street so that it can stay there throughout the day and remain a steadfast reminder of the regulated parameter they have to stay within. Instead of coming to each vendor to distribute the toolkits, we will do it at the place where all of them go to, their key supply channel - The Hunt Points Terminal Market. One rainy morning, we stopped by to have a quick chat with Palash. He pointed to us , right next to his stand, the LinkNYC, a first-of-its-kind communication network that brings the fastest free public Wi-Fi to millions of New Yorkers and visitors. 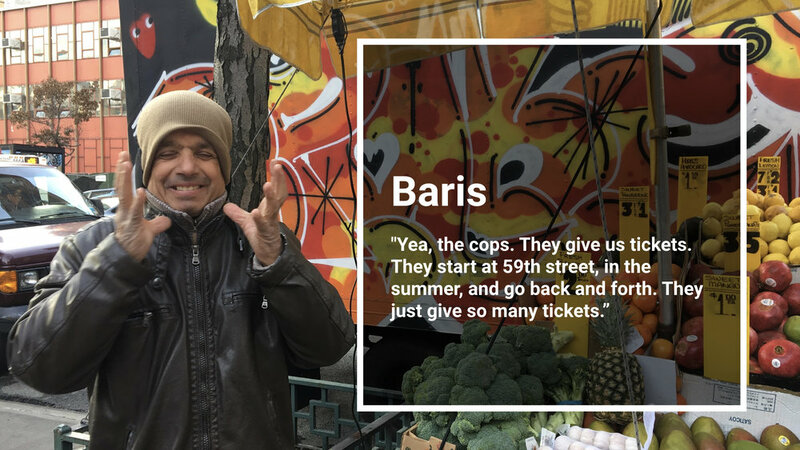 As an international infrastructure project, LinkNYC can enable the use of credit cards in purchasing produce from the street vendors, which makes it one their key salient attributes. ground as they communicate with inspectors and police officers, and integrate ways to use WIFI from LinkNYC. Ultimately, they will experience an increase in profit and revenue. At the end of the day, we hope to see the vendors feeling welcomed, emotionally & financially secured, supported and empowered. Next time you plan to go buy fruits or veggies, check out your nearby vendors.